Jesus loves everyone no matter who they are or what they do. We learned in the scriptures that he especially loved little children, just like your child. The goal of this lesson is to help your child feel the Saviors love for them and teach your child how to follow Jesus' example and love everyone. 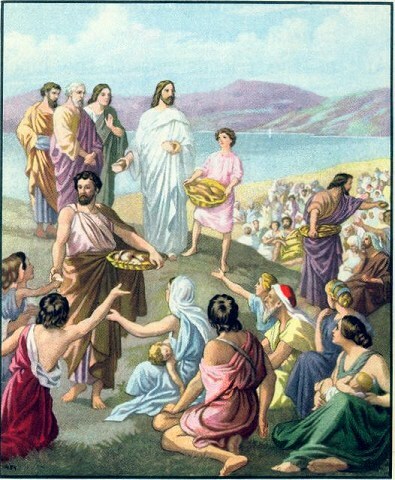 Know where the pictures of Jesus Blessing the Children are and Jesus feeding the multitude with loaves and fishes. Read the verse, you can also simplify the verse by saying "Jesus told us to love everyone, just like Jesus loves us!" He loved the children and blessed them! To make a lot of food so everyone could eat as much as they wanted. *You can find a picture of Jesus Blessing the Children by clicking this linkand you can find the picture of Jesus feeding the multitude by clicking on this link. Activity: Color a Picture for Someone you Love! I would suggest coloring a picture for grandparents for this activity! Get some supplies together, some paper and crayons, markers, or pencils, and color a picture for someone you love,. Help your child write, or write for them, "I love you!" on the bottom corner. You can even get an envelope ready and help your child mail the picture once they are done coloring. This would be a great way to show someone that you love them! No special treat this week. For any suggestions or comments for this lesson - post them here!